Raccoons scurry across porches. I saw it. 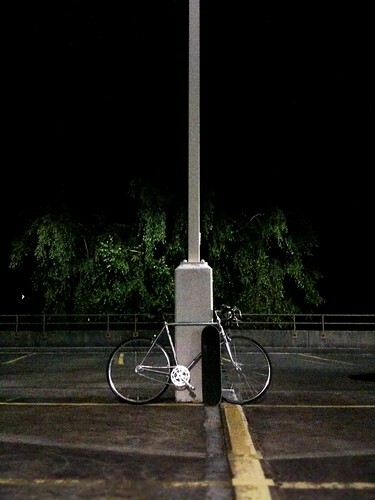 The other night while I was riding my bike home just after dark. They apparently usually travel in pairs. This one was alone. Extra scurry that way. Unless his partner scurried under the porch out of sight. Urban raccoons. It’s neat how they run. Like odd shaped bear cubs with funny tails. Of course, this wasn’t the first time I’ve seen urban raccoons tearing around the neighborhood. They hang out a lot. In pairs. Sometimes they scare the neighbors and dig through garbage. Other times they just pass by while I’m having important late night conversations in the driveway. Sometimes then end up dead in the roadway. More urban animals please. If we can manage to not accidentally hurt them. And they don’t pester our domesticated animals.